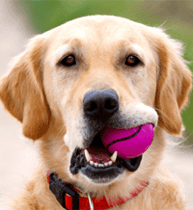 7 Reasons to Teach Your Dog New Tricks! Teaching your dog new tricks might not be the easiest thing in the world, but it’s highly beneficial to you and your dog. Teaching your dog new tricks can help strengthen your relationship with your beloved pet in many ways. Below are some great reasons why you should start teaching your dog new tricks. 1. Make everyone safe– While learning to teach your dog new tricks, you learn many training techniques which can also be used to gain control over your dog. Teaching him basic tricks like sit and stay can also be used in life situations like crossing the street or entering a store. 2. Give Your Dog Something to Do– It doesn’t take long before your dog gets bored and decides to take on a new hobby of chewing anything in sight, including your brand new sofa. Teaching your dog new tricks will keep him focused on the task at hand, and will entertain him for hours! 3. Help Keep Your Dog’s Mind Sharp– Training your dog will keep his mind active and responsive. As dogs get older they become less physically active, but learning tricks will keep his mind active and alert. 4. Help Create a Better Bond between You and Your Dog– Your dog will look up to you as being the pack leader, and will listen to you instead of trying to get your attention in destructive ways. Best of all, once you teach your dog new tricks, the both of you will become a team. 5. Show Off– You can show off your dog if you teach it some cool tricks, and your dog will get people’s attention. Dogs love attention and they love being in the spotlight so they will like performing in front of your friends and family. Of course, you will also get the recognition of being a star trainer. 6. Make Vet Check Ups Easier– Both the veterinarian and you dislike it when your dog can’t control itself during a checkup. If you teach it to be calm during the check up, it will make both of your lives easier and you won’t be embarrassed that your dog is acting up. 7. Gives Your Dog a Hobby– We all have hobbies we like to do such as watching TV or playing games, but dogs also need things to do. Training your dog new tricks is a great way to pass the time on a rainy day when you can’t take him for walks. If these reasons have inspired you to teach your dog tricks, then you’ve come to the right place. We have a great dog forum that is full of dog owners training their dog new tricks every day! Very true about stopping them from amusing themselves. My boy Ra Kismet hasn’t really chewed much at all. Just LOL the car clicker thingee and a sock. He adores learning tricks too.